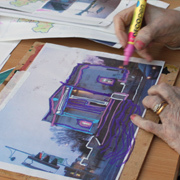 As part of O-Fest in Offerton, the Travelling Art Tent will be sharing the art space with residents at Lisburn Court. The Travelling Art Tent will be making an appearance at the Brinnington Arts Festival, just down the road from Bryn Haven. 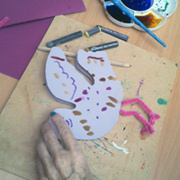 Drop-in art workshop for older people. 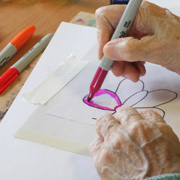 If you haven't picked up a pencil since school and are interested in being creative, or you consider yourself 'arty' already, come and have a go at art activities for the afternoon. All guidance and materials provided, just turn up for 15 minutes or stay for the whole workshop! Informal talk by artist Stacey Coughlin on the methodology behind The Travelling Art Tent project and ideas around working creatively with older people. Suitable for anyone who works with or cares for older people. Afternoon celebration event for all the residents, relatives, staff, friends etc. of the homes and organisations involved. The Travelling Art Tent will be briefly visiting the Community Art Gallery at Arc for one of their wonderful Saturday afternoon events. There will be activities and, for those who won't be able to get to Stockport Art Gallery, a chance to see the Travelling Art Tent until 13th February.